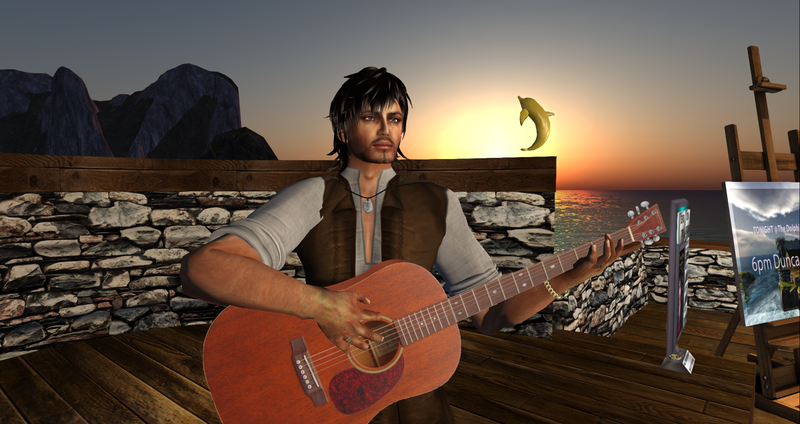 Duncan Bagley at the Dolphin Cafe TOMORROW NIGHT – 6 pm SLT! Duncan Bagley sings an acoustic potpourri of traditional Celtic and folk songs; covers of artists such as John Denver, Harry Chapin, Gordon Lightfoot, Leonard Cohen, and Peter, Paul and Mary; and a number of original compositions – Even some show tunes and Sinatra. His warm baritone voice accompanied by his soothing acoustic guitar provides his audience with an hour of wistful memories. Join us TOMORROW NIGHT 6pm SLT at The Dolphin Cafe – here’s your boat ride! This entry was posted in Uncategorized and tagged Best in Second Life, Calas Galadhon, Live Music in Second Life, Second Life, The Dolphin Cafe, Virtual Reality, Virtual world by Romie Vella. Bookmark the permalink.